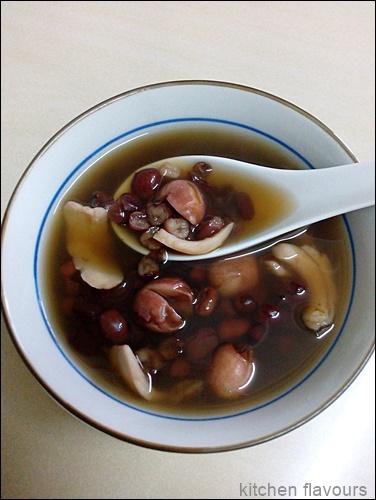 Red Bean and Lotus Seed Dessert, is usually served in Chinese homes during the weekends when everyone is around to enjoy a bowl. It can be served as an afternoon "snack" for tea-time, or as a light warm dessert, after dinner. Or have a bowl anytime of the day! Very easy to prepare. Rinse the ingredients, bring a pot of water to a boil, add the ingredients, let it come to a boil again, then reduce heat to low and simmer for 1 to 1-1/2 hours until the red beans, lotus seeds and lily bulbs are tender. Add some rock sugar, either white or brown, your preference, to taste. May be served warm or at room temperature. I like it best when it is still very warm, almost still hot! 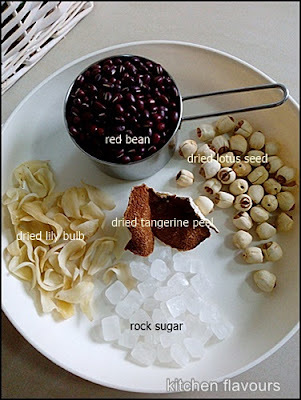 The ingredients ; dried lily bulb, dried red beans, dried lotus seed, dried tangerine peel and rock sugar. Each of these ingredients has its own health benefits according to TCM (Traditional Chinese Medicine). Click on the ingredients for the link to TCM to read more on the medicinal properties of these ingredients. This dessert is not only delicious, but good for you! Rinse dried red beans a couple of times with clean tap water and drain. Rinse the rest of the ingredients once and drain. Bring water to a boil in a medium sized stockpot, add all the ingredients. Bring to boil once again, reduce heat and simmer for 1 to 1-1/2 hours until the beans, lotus seeds and lily bulb are soft and tender. Add rock sugar to taste. This dessert may be served at room temperature, but it is especially good when served still very warm. I've made two more recipes for Potluck Week at I Heart Cooking Clubs, with recipes from two of IHCC's past featured chefs, Jamie Oliver and Mark Bittman. Jamie Oliver's Chicken Stew is delicious. Taken from his book Jamie's Food Revolution, he has given the basic stew ingredients with four options to select from, with different meat and booze, to make four different stews. I've made Chicken Stew, using chicken thigh meat and white wine. I've followed everything in the recipe but I have used a fresh sprig of rosemary from the garden pot instead of fresh thyme and added an extra stalk of celery. This stew can either be cooked on the stove or in the oven. I cooked mine on the stove, for about 1 hour 15 minutes. It was easy and very flavourful. Wanted to serve the stew with rice, I've made Mark Bittman's Simpler-Than-Pilaf Baked Rice, basmati rice cooked with cinnamon stick, cloves and cardamom pods. The spices are sauteed with a little butter and oil, then the rice is stirred in with some salt and pepper. Add the water, let it come to a boil, cover the pot and place it in the preheated oven to bake for 10 minutes. I actually baked the rice for 30 minutes, as I have always cooked my rice in the oven this way. Once the rice is done, leave it for 15 minutes, fluff with a pair of chopsticks. Since I've cooked the rice much earlier, I simply transferred the cooked fluffy rice to the rice cooker, switched on with the "Keep Warm" function. Rice will be kept fluffy and hot until serving time. 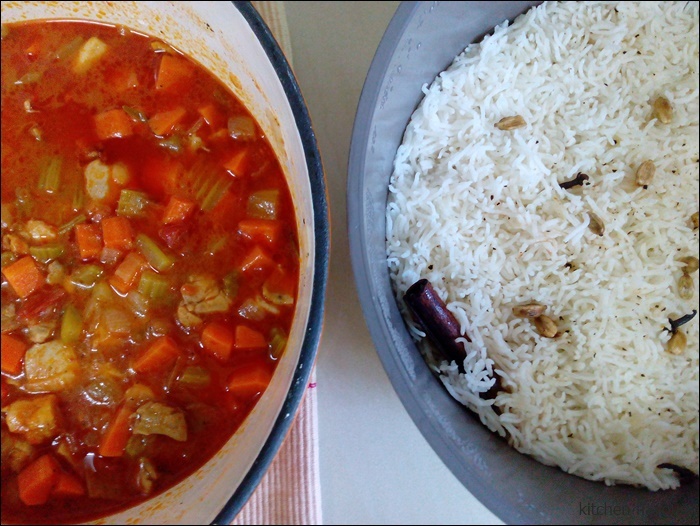 Jamie Oliver's Chicken Stew and Mark Bittman's Baked Rice. We had the Chicken Stew and Baked Rice with Diana Henry's Slow-Cooked Garlic Courgettes for dinner. Delicious! If using the oven to cook your stew, preheat it to 350F. Trim the ends of your celery and roughly chop the stalks. Peel the carrots, slice lengthways, and roughly chop. Put a Dutch oven on a medium heat. Put all the vegetables and your chosen herb into the pan with 2 lugs of olive oil and fry for 10 minutes. Add your meat and flour. Pour in the booze and canned tomatoes. Give it a good stir, then season with a teaspoon of sea salt (less if using table salt) and a few grinds of pepper. Bring to a a boil put the lid on, and either simmer slowly on your cooktop or cook in an oven for 1-1/2 hours. Remove the lid for the final half hour of simmering or cooking and add a splash of water if it looks a bit dry. When done, your meat should be tender and delicious. Remove any herb stalks before serving, and taste it to see if it needs a bit more salt and pepper. Heat the oven to 350F. Put half the butter or all of the oil in an ovenproof pot with a lid over medium heat. When the butter is melted or the oil is hot, add the spices and cook for about a minute. Add the rice and some salt and pepper and cook, stirring for about a minute. Add 2-1/2 cups water, bring to a boil, cover, put in the oven, and bake for 10 minutes. Remove the rice from the oven, but do not uncover; let it rest in a warm place for another 10 minutes. Remove the cinnamon and cloves (the cardamom pods are good to eat); taste and adjust the seasoning if necessary, stir in the remaining butter if you are using it, and serve immediately. It's Potluck week at I Heart Cooking Clubs (IHCC). I've not made any of Diana Henry's recipes for quite a while, and it's time I revisit her book, Food From Plenty. I bought two zucchinis a few days before and was looking for recipes to use them up, found this delicious sounding dish, Slow-Cooked Garlic Courgettes. There's garlic, so it must be delicious! The only ingredients required for this dish are just courgettes and garlic. Can never get simpler than this! Diana Henry uses 6 garlic cloves, but I have used 10 fat garlic cloves, might as well since it is all about the garlicky flavour! Peel and slice the garlic thinly, and the courgettes are sliced into thin rounds, the thickness of a coin. 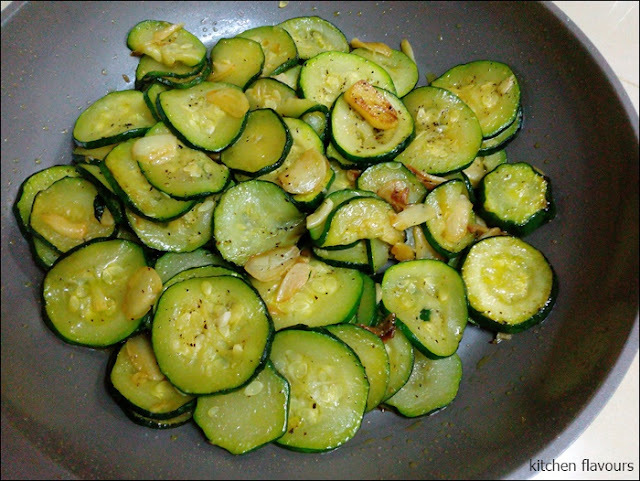 Heat some butter and olive oil, then saute the garlic slices until soft and fragrant, tip in the sliced courgettes, increase the heat so that the courgettes get a bit of colour, then reduce heat and continue to cook until the courgettes are soft and almost collapsing. Season with salt and pepper to taste. 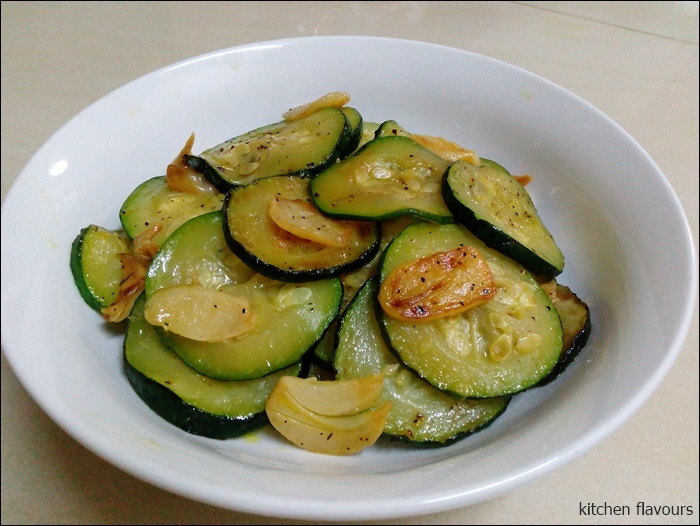 The courgettes will release some its own water, so this dish is fairly moist. Yum yum! The courgettes is very soft, tender and smells so nice from the garlic. I can understand why Diana Henry says she could eat a plateful on its own! I serverd this as a side dish with some stew and pilaf rice, sharing that in next post. "Heat 15gm (1/2oz) unsalted butter and 3 tbsp olive oil in a very large frying pan and gently cook 6 garlic cloves, very finely sliced, until soft but not coloured. Now add 500gm (1lb 2oz) courgettes sliced to the thickness of a pound coin, and turn over to coat. Increase the heat a bit so the courgettes get a little bit of colour, then reduce the heat, season and cook slowly (you almost "stew" them in the butter and oil) until completely soft, almost collapsing. This tastes purely of courgetts and doesn't need anything else. I can eat a plateful on their own." Members can choose any of these cakes to bake, and my choice is Chocolate Kugelhopf, since I am drawn to yeasty bakes! This Chocolate Kugelhopf has a chocolate ganache swirls in it. 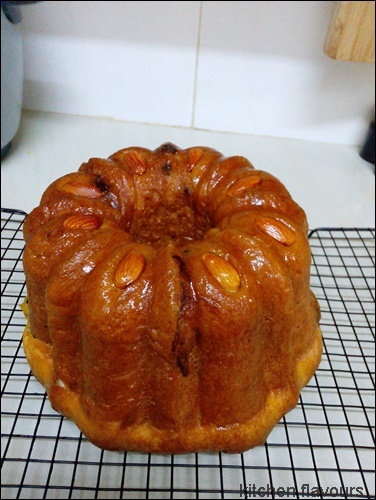 It bakes into a soft and nice kugelhopf, but the process of making it is rather frustrating (to me!). The recipe uses 1 whole egg and 2 egg yolks, but the instructions says to mix in the egg yolks without any mention of the whole egg, and I was wondering whether should I use the whole egg as well or was it a typo error in the instructions. I went ahead and add the whole egg, assuming that it has been left out in the instructions. The dough is like very thick batter, and I have to add almost half a cup of extra flour so that it is a little doughy, and even then, the "dough" is still very soft and so, so, sticky. I thought of adding more flour but am afraid that the bread will be dry, as I've added about 30% extra to the original amount. Honestly I almost gave up and thought of dumping the dough. But I went ahead anyway and hope for the best! I left the dough to proof for the first rising, punch it down, and it was supposed to be rolled on a floured counter. No way I could roll the very soft, very sticky dough without it sticking onto the counter, and it would definitely stick to the rolling pin from the looks of it, even if I flour the top, I would need quite an amount of flour, and I am not confident that I could transfer the very soft dough onto a baking sheet, which is to be refrigerated for 30 minutes. I placed the dough on a large sheet of plastic, which I placed on an upturned baking sheet, then place another large sheet of plastic over the dough, and use a rolling pin to roll it into a large rectangle. Refrigerate for 30 minutes, keeping fingers crossed that it will be easier to work with later on. Remove from the refrigerator and immediately spread the ganache all over. Roll the dough, swiss roll style. Still too soft to roll, and with the help of a wide pastry cutter, I tried rolling it but it was difficult to roll as the dough was sticky. In the end, it looks like a misshapen lump of log, rather than a nice rolled up smooth log of a dough. I know definitely that there will not be any pretty swirls in there! Bring the two ends together into a ring, adjust the dough, by shaping it gently, with floured hands, so that it is more or less the same thickness all around. Gather the dough and place in the greased bundt pan, with a whole almond placed in each ridge at the bottom of the bundt pan. Cover with greased cling wrap and left to rise until doubled in size. It certainly rises well! Bake in a preheated oven for 35 minutes, though I baked mine for an additional 5 minutes to get that really brown colour on the crust. It looks really huge after baking and I do hope that the kugelhopf will turn out good! Let the kugelhopf rest for 10 minutes in the pan, then unmold onto a wire rack, glaze while still warm with some glaze, with a recipe provided for it. Since I have a container of apricot glaze, I used that instead. 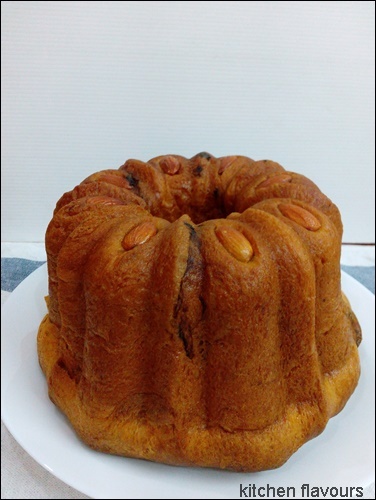 Allow the kugelhopf to cool. I could not wait to slice, to see the inside and taste it. But I was rather pleased with how it looks like from the outside! Once it has cooled down, the glaze disappeared, no longer glossy! But I'm not concerned with that. I am eager to see the inside! No pretty swirls! But the taste makes up for it! 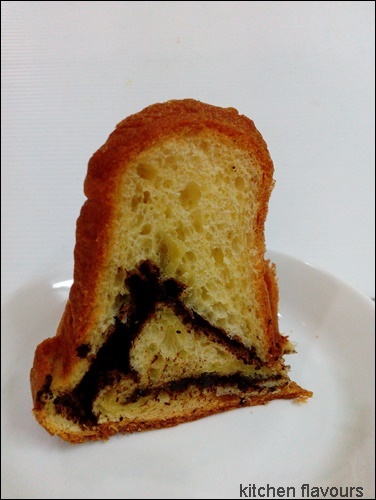 This Chocolate Kugelhopf is soft and fluffy. Tasted really good with the addition of chocolate ganache. The kugelhopf was still soft the next day when we had it for breakfast, and we enjoyed slices of it with our morning coffee. That being said, I will not be making this again, but I was glad that I have given it a try. Note : I've used 1 teaspoon instant yeast instead of the fresh yeast calls for in the recipe. For the ganache, I've used dark chocolate instead of semisweet chocolate. I baked in a 6-cup Nordic Ware bundt pan. 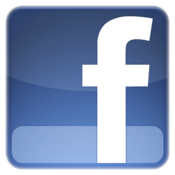 This week at I Heart Cooking Clubs (IHCC), the theme is How Easy Is That? We are cooking with Ina Garten@Barefoot Contessa. She has a book titled as such, How Easy Is That?. But we can cook any of her recipes which we deem easy, not necessarily from this book. 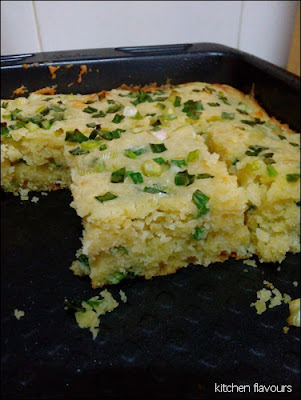 And I've made her Jalapeno Cheddar Cornbread, as I love cornbread! I got this recipe from her website but it can also be found in another of her cookbook, Barefoot Contessa At Home. I have made quite a number of cornbread with different recipes over the years, and after making Ina's recipe, it is one of my top favourite, preferring her cornbread to Hugh-Fearnley Whittingstall's recipe which I've made here. Ina's recipe made quite a large tray, since there are only three of us, I have made only half, and baked in a 8"square baking pan. A very easy and quick cornbread to make. Mix all the dry ingredients in a large bowl, the wet ingredients in another bowl, then mix the wet ingredients into the dry ingredients, stir to combine but do not overmix. The batter is then left for 20 minutes at room temperature before it is poured into the prepared baking pan and bake for 30 to 35 minutes until done. How easy is that? I've used salted butter, so I have omitted the salt. I've used two whole jalapenos and added more scallions than the recipe calls for. For half a recipe, I've used only one extra-large egg. 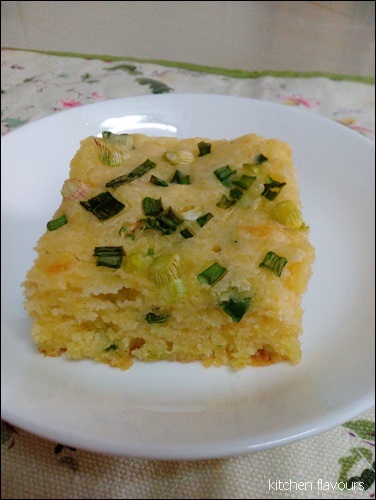 I did not scatter any Cheddar over the batter, I've sprinkled only with the chopped scallions. This cornbread is really, really, yummy! And I would add more jalapenos the next time. So moist, with soft crumbs and delicious, especially when eaten while still warm. A few slices is great for a simple lunch, and it is also really good for afternoon tea-time, with a mug of warm tea, which is how I enjoyed it! Combine the flour, cornmeal, sugar, baking powder, and salt in a large bowl. In separate bowl, combine the milk, eggs, and butter. With a wooden spoon, stir the wet ingredients into the dry until most of the lumps are dissolved. Don't overmix! Mix in 2 cups of the grated Cheddar, the scallions and jalapenos, and allow the mixture to sit at room temperature for 20 minutes. Meanwhile, preheat the oven to 350 degrees. Grease a 9x13x2-inch baking pan. It has been sometime since I've tried any new meat curry recipes from Madhur Jafrrey because I keep going back to the few favourite recipes that I've made before. 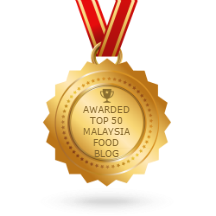 Among my top MJ's favourite meat curry dishes are Meatball Curry, Kerala-Style Bhuna Pork, Pork In A Mustard Spice Mix, Goan Pork Vindaloo with Potatoes, and our top favourite in my house, Red Pork Curry. I have cooked this many times since then. 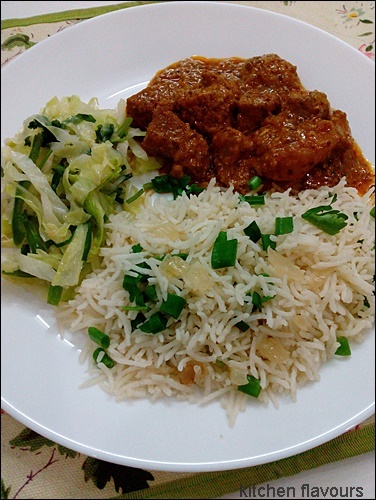 Last week I've made Ina Garten's Scallion Basmati Rice, Madhur Jaffrey's Cabbage with Garlic and Shallots, and to complete the menu, this Pork Vindaloo, another one of MJ delicious curry. This recipe has very few ingredients, and if you love cooking curries at home, like I do, you would probably have the spices needed, ground cumin, ground turmeric and chilli powder. Yup only three spices! The surprise ingredient here is grainy French mustard. In Madhur Jaffrey own words, "Most recipes for vindaloo involve grinding mustard seeds in vinegar. To save this step, I have used grainy French Pommery mustard (Moutarde de Meaux) which already contains vinegar. It works beautifully." And I totally agree with her, it works deliciously! And in a vindaloo recipe, garlic is one of the essential ingredient. Along with the onions used, this is my third post for this week's IHCC theme, October Monthly Featured Ingredient Challenge : Alliums ! I've doubled the recipe, as always, for curries like this, as a single recipe is never enough. I would suggest you do the same if you are cooking for 4-6 people. Leftovers is always a good thing for curries like this. The only changes I've made is to use 2-1/2 times more of the spices. For the chilli powder, MJ says that more can be added if you prefer a spicy dish. Of course we do! I have used 2 tablespoons, as the one I used is medium-hot. Use less if the chilli powder is extra hot. I have however reduced the amount of coconut milk, as I have always prefer to use less coconut milk for curries like this. I want the flavour and taste of the spices to stand out boldly, and not to be tone down by the creaminess of the coconut milk. So for double recipe, I have used only about 150ml of coconut milk, with 350 ml water. Using French grainy mustard is indeed a great idea of MJ! The grainy mustard is mixed with the three spices, salt and vinegar in a small bowl. Slice the onions into half rings and crash the garlic into a pulp. Fry the onions in some oil until medium brown, then add the garlic, stir for 30 seconds, then add the mustard mixture. Stir and fry for about 1 minute, then add in the meat, stir fry for 3 minutes. Pour in the coconut milk and water. Cook for about an hour, stirring now and then, until the meat is tender. 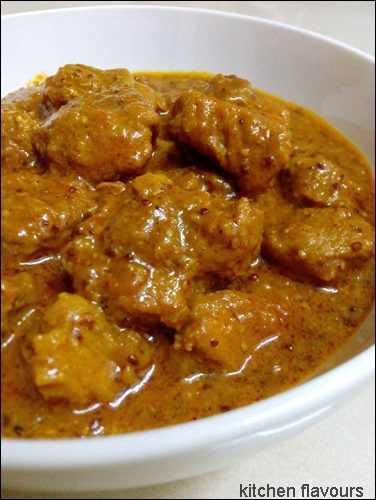 You may need to add a few tablespoons of water if the curry appear dry during cooking. Delicious Pork Vindaloo! Tender meat, infused with the flavours of the spices and vinegar. And we love the gravy. 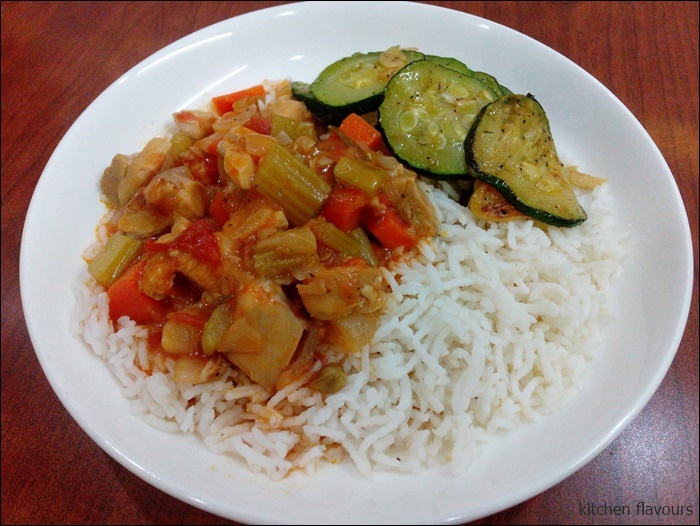 This delicious dish is so good with the Scallion Basmati Rice and the Cabbage. Looks like this is one more curry that will be repeated in my kitchen! Combine the mustard, cumin powder, turmeric, chilli powder, salt and vinegar in a cup. Mix well. Slice the onions into fine half-rings and crush the garlic to a pulp. Put the oil in a large, non-stick frying pan and set over medium-high heat. When hot, add the onions. Stir and fry until they are medium brown. Add the garlic. Stir and fry for 30 seconds. Add the paste from the cup. Stir and fry for a minute, then add the meat. Stir and fro for about 3 minutes. Now add in the coconut milk and 150ml (5fl oz) water if you are going to cook in a pressure cooker and 250ml (8fl oz) water if you are going to continue to cook in the frying pan. (Transfer to a pressure cooker at this state if that is your intention). Cover and either bring up to pressure, or to a boil if you are using the frying pan. Lower the heat to a simmer and cook for 20 minutes in a pressure cooker and 60-70 minutes in the frying pan. 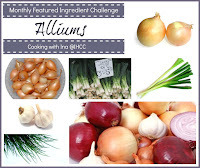 My second post for I Heart Cooking Clubs (IHCC) theme for this week, October Monthly Featured Ingredient Challenge : Alliums ! I've made a simple, vegetable side dish, Cabbage with Garlic and Shallots, one of Madhur Jaffrey's recipes from her cookbook World Vegetarian, a thick book with 650 vegetarian recipes! Ingredients used are cabbage, garlic, shallots, green chile, scallions and Chinese celery of which I have replaced with fresh cilantro. Recipe calls for 1/4 cup of water, the next time I will use only a tablespoon or two just to moisten the dish, since I've skipped the part where it says to cover and cook for 5 to 7 minutes. The cabbage is young and tender, so it takes just a few minutes of stir-frying to wilt it down and soften it a little. Instead of stock, I've used water, since the cabbage is sweet, the veggie stock is not really necessary. A simple lovely side dish, which I've served with Ina Garten's Scallion Basmati Rice and a curry dish, which I will be sharing in my next post. Put the oil in a large, wide pan or large wok and set over medium-high heat. When hot, put in the shallots and garlic. Stir and fry for a minute. Put in the green chile and stir for another 30 seconds. Now put in the scallions, cabbage, and celery. Cover, turn the heat to medium, and cook for 5 to 7 minutes, or until the cabbage has wilted completely. Uncover, turn the heat up a bit, and stir for another minute or two. Taste for salt and pepper. Week two with Ina Garten at I Heart Cooking Clubs (IHCC), and this week's theme is Monthly Featured Ingredient/Dish - Alliums! Garlic, onions, leeks, chives, scallions, shallots...and we get to select any recipe that uses one or more of these ingredients from any of the featured chefs at IHCC's chefs list. Recipes are endless! Decided to make Ina Garten's Scallion Basmati Rice. Instead of cooking the rice over the stove, I use the rice cooker, so that I could use my time to get on with other dishes. Start by sauteing chopped yellow onion in some oil until translucent, then add the basmati rice, stir well. At this point, I transfer the rice into the rice cooker, then add some water and salt. Let the rice cooker do the cooking, with the keep warm function when the rice is done. When it is time to serve, simply fluff rice with a fork (I use a pair of chopsticks), add the chopped scallions and parsley (I use cilantro). Serve immediately. Very nice rice! We had this with two other dishes, coming up in next post. Will definitely make this rice again! 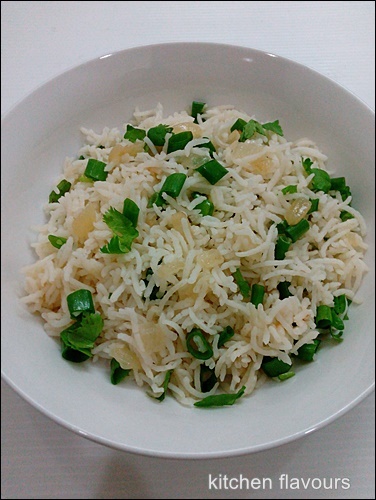 the water is absorbed and the rice is tender, about 15 to 20 minutes. Turn off the heat and allow to sit covered for 5 to 10 minutes. Add the scallions and parsley, fluff with a fork, and serve. Sometimes what we crave is just a simple buttery cake, no fuss with any frostings or creamy topping. In fact, I have always prefer plain cakes like this Lemon Pound Cake. This is one of the best lemon pound cakes I've baked. The cake is moist with dense but delicious soft crumb texture. Very buttery and lemony, with the addition of the lemon glaze poured over the cake, it is packed with lemony flavour, in every bite. I've made half a recipe, using half the amount of the ingredients, but I have further reduced the amount of sugar and lemon juice. (refer to the notes in the recipe below). The lemony glaze is brushed over the cake while still warm. This cake is moist, dense with soft velvety crumbs. If you love lemons then you will love this cake. Goes perfectly with a cup of warm tea. Preheat the oven to 350 degrees. Prepare a 10-inch Bundt pan with lots of pan spray and sprinkle it with granulated sugar. (Flour will leave an unattractive residue on the cake). In a medium bowl, cream the butter and sugar until they are light and fluffy, Add the vanilla and lemon zest. Mix them together. Add the eggs one at a time, mixing well after each addition. Scrape down the sides of the bowl. Mix the sour cream and lemon juice together. Add the flour and sour cream mixture alternately, finishing with the flour. Spoon the batter into the prepared pan. Bake it for 1 hour or until a cake tester or toothpick comes out clean when inserted in the centre. Mix all the ingredients in a small saucepan and stir. Cook them over low heat without stirring till the sugar disssolves. Turn the heat up to medium and cook the mixture until it becomes syrupy. Don't overcook it or the syrup will start to brown. When the cake is baked, cool it for 10 minutes in the baking pan and invert it onto a plate. (Place the plate against the bottom of the pan and turn it over). Slowly pour the glaze over the cake and let it cool. - use only 2 tablespoons of lemon juice for the batter as the lemon was really sour. 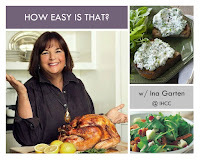 I Heart Cooking Clubs (IHCC) is cooking with a new chef, starting this week, Ina Garten, popularly known as Barefoot Contessa. We will be cooking from her recipes for the next six months, and it is going to be a six delicious months. 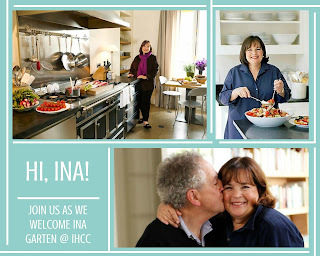 To welcome Ina Garten into our kitchen, the theme for this week is Hi, Ina ! A small knob of butter and some cream is poured at the bottom of the gratin dish, and put under the broiler until butter melts. When both the butter and cream are bubbling, remove from oven and carefully pour two or three eggs into the dish. (Ina says to get the eggs ready by breaking them into a bowl first without breaking the yolks, and gently pour into the hot gratin dish). 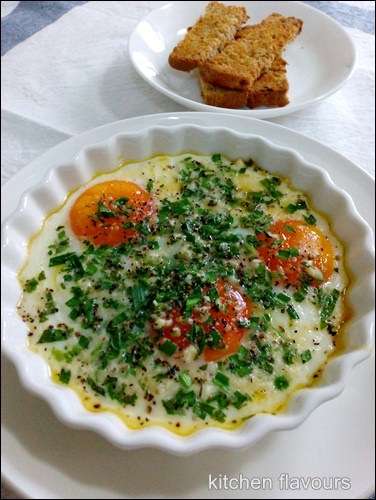 Sprinkle some chopped herbs which are mixed with some grated Parmesan, on top of the eggs, with salt and pepper to taste. For the herbs, I've used rosemary leaves, Chinese chives, and some fresh coriander. Back under the broiler for 5 to 6 minutes until the egg whites are almost cooked. Serve hot with toasted bread. I've toasted some homemade Onion Caraway Rye Bread which I made the day before. I sliced the bread, butter on both sides, cut into batons, then toast until brown and crispy. This is so yummy. Fragrant from the herbs and so good to eat with the toasted Onion Caraway Rye bread. Yum! Combine the garlic, thyme, rosemary, parsley, and Parmesan cheese and set aside. Carefully crack 3 3ggs into each of 4 small bowls or teacups (you won't be baking them in these) without breaking the yolks. (It's very important to have all the eggs ready to go before you start cooking). Place four individual gratin dishes on a baking sheet. Place 1 tablespoon of cream and 1/2 tablespoon of butter in each dish and place under the broiler for about 3 minutes, until hot and bubbly. Quickly, but carefully, pour 3 eggs into each gratin dish and sprinkle evenly with the herb mixture, then sprinkle liberally with salt and pepper. Place back under the broiler for 5 to 6 minutes, until the whites of the eggs are almost cooked. (Rotate the baking sheet once if they aren't cooking evenly). The eggs will continue to cook after you take them out of the oven. Allow to set for 60 seconds and serve hot with toasted bread. Come and join us as we cook with Ina. Full details here.